Sober Look: Crude rally about to sputter? Crude rally about to sputter? 1. The physical oil market seems to be facing challenges resulting in a disconnect from the futures market. We've seen this movie before, and it doesn't end well. Reuters: - Tens of millions of barrels are struggling to find buyers in Europe with traders of West African, Azeri and North Sea crude blaming poor demand. "Being large physical buyers of crude we have a direct pulse of the market and feel immediately when it is well supplied, as is happening now," Dario Scaffardi, executive vice resident and general manager of independent Italian refiner Saras, told Reuters. 2. While US oil rig count continues to decline (see chart), the recent price increases have been sufficient to bring some rigs back online. US oil production has stopped growing but so far it is not declining and remains significantly above last year's levels. Bloomberg: - For the first time in five months, a rig in the Williston Basin, where North Dakota’s Bakken shale formation lies, sputtered back to life and started drilling for crude once again. And then one returned to the Permian Basin, the nation’s biggest oil play, field services contractor Baker Hughes Inc. said Friday. 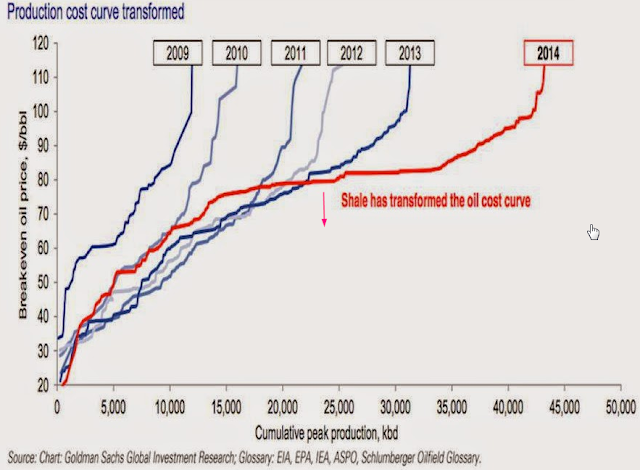 Some forget that in the current price environment US firms are pushing rig efficiency to new levels and the cost curve is expected to shift lower.